Skeuomorph: Fake leather textures on your mobile apps – good or bad? Skeuomorph. I learned this word a few weeks ago, after a flurry of stories broke on various mass-media websites about an apparent kerfuffle within Apple about user interface design. A skeuomorph is a design element that looks functional, but is actually purely ornamental. The automotive world is rife with skeuomorphs. Fake hood scoops on sports cars, plastic tire covers that imitate wire wheels, plastic that’s textured and painted to look like wood. Check out the Wikipedia page and you’ll see several examples, including the program that sparked a number of articles. 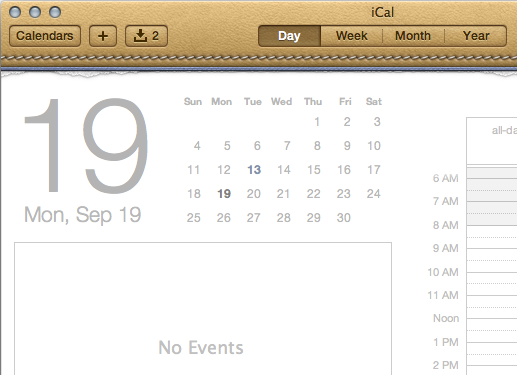 That’s Apple’s iCal calendaring application on the company’s iPhone and iPad devices, or Calendar on a Mac. Look at the calener on an iPad. See how the app is designed to resemble an old printed calendar, and the top of the app looks like embossed leather, complete with stitching? See how there’s even a little graphic detail that make it look like pages have been torn out. Some find that kitschy or distracting. Some find it cute. Some people, like me, never particularly noticed those elements. Some people, apparently like the late Steve Job, believe that faux-reality designs like the leather calendar, or like the wooden bookshelves in iBooks, enhance the experience. Some people, apparently, are infuriated by the notion of foisting an outdated analog user-interface model on a digital device. Some of these designs may be nostalgic to older customers, but may be increasingly meaningless to most consumers of digital products. I’ve seen phone-dialer apps that look like the old rotary telephone dial – and they’re stupid, in my humble opinion. 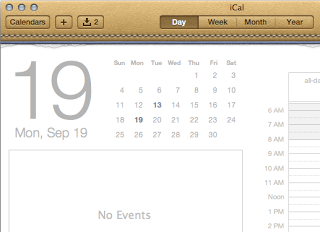 So are address-book apps that look like an old Rolodex, or calendar programs that resemble the Pocket Day-Timer I carried around in the 1980s and 1990s. If you (or your young coworkers) never used a rotary phone, or owned a Rolodex, or carried a Day-Timer, those user interface metaphors make little sense. They don’t enhance productivity, they detract from it. https://alanzeichick.com/wp-content/uploads/ICal_5.0_closeup.png 232 320 Alan Zeichick http://alanzeichick.com/wp-content/uploads/alan-zeichick-logo.png Alan Zeichick2012-10-03 16:23:002016-06-23 09:30:56Skeuomorph: Fake leather textures on your mobile apps – good or bad? Ouch. This is the worst case scenario for Samsung. Forget about the US$1.049 billion in damages that Samsung is supposed to pay Apple. What this means is that the jury agreed with what everyone knew simply by looking at the hardware and playing with the software: the Samsung Galaxy Tab 10.1 is just like the iPad. We can expect to see a lot of introspection within the Android ecosystem. Google, Samsung and the other device manufacturers will look close, really close, to make sure they stay away from the specific patents cited in this case. We can expect to see software updates and hardware guidelines that will take Android devices farther from Apple’s devices. On the short term – this will depress sales of Android devices. On the longer term, we will see a ton of innovation that will truly differentiate Android from iOS. For too long, Android handset- and tablet-makers have been trying to get as close to the iPhone and iPad design as possible. It’s not laziness or a lack of technical savvy, in my opinion. It’s just that Apple has done such a good job of defining the smartphone and tablet that consumers expect that, well, that’s just how the platforms should work. Salespeople want to sell Android devices that are identical to Apple devices, only less expensive. Of course, with rumors that Apple is about to release a 7-inch iPad, the job of Android tablet companies is only going to get harder. 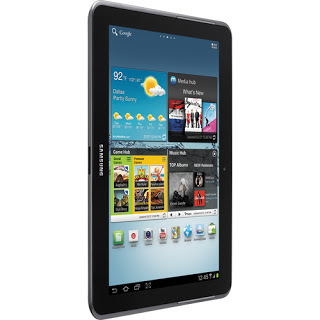 In my own informal polling, folks who have purchased 7-inch tablets have done so mainly because Apple doesn’t sell one. For the next year or so, Samsung and the whole Android community will fall back and retrench. 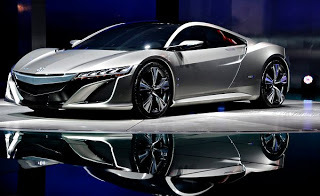 That will involve unleashing innovation that may have been stifled, as they preferred to imitate the iOS designs instead of pushing their own ideas. Imitation may be the most sincere form of flattery – but in the smartphone and tablet markets, imitation is off the table. For good. Let’s talk about the HP-67 and HP-97 programmable calculators. Introduced in 1976, both those models hold place of pride in my collection of vintage computation devices – which consists of a tremendous number of older Hewlett-Packard and Texas Instruments calculators, as well as dozens of slide rules going back to the late 1800s. The four-function pocket calculator was the feature phone of its era. Arriving in the early 1970s, they swiftly replaced adding machines. The HP-35 calculator (1972) with its trig, log and exponential functions, singlehandedly killed the slide rule industry. 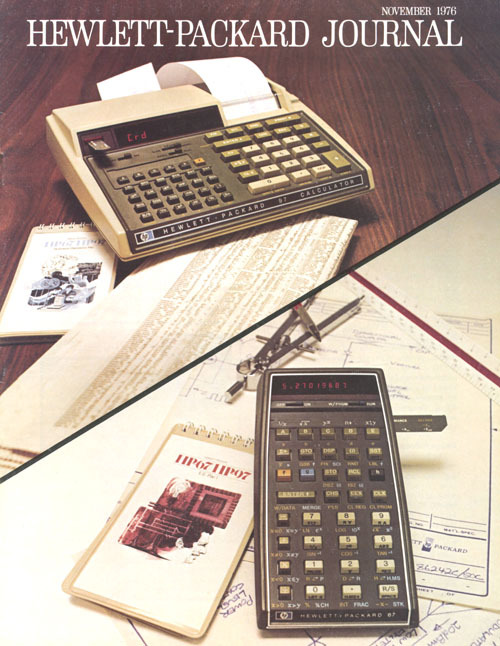 Programmable calculators with persistent removable storage – specifically Hewlett-Packard’s HP-65 (1974) and Texas Instruments’ SR-52 (1975) – were the equivalent of the first smartphones. Why? Because you could store and load programs on little magnetic cards. You could buy pre-written packs of programs on those cards from HP and TI. There were user groups where calculator programs could publish and share programs. And there were even a few commercial developers who sold programs on cards as well. Some of my earliest published programs were written for HP and TI calculators in the mid-1970s. A foundational part of my own history as a computer scientist was learning how to do some pretty sophisticated work with only a few hundred bytes of addressable memory. Not megabyes. Not kilobytes. Bytes. In modern terms, we would call calculator programs distributed on mag cards “apps.” The HP-65 Users Library and the TI PPX-52 (Personal Program Exchange) were among the first app stores. This brings me to the HP-67 and HP-97, which were introduced simultaneously at prices of US$450 and $750, respectively. They were essentially the same device – except that the HP-67 was a 0.7-pound pocket calculator and the HP-97 was a 2.5-pound battery-powered desktop model with a built-in thermal printer. “Calculator” is probably the wrong word for these devices. They were portable computers – in fact, they were truly personal computers, albeit with a custom microprocessor, one-line numeric display and only 224 bytes of programmable memory. Although the form factors and key placement were different – and the HP-97 had the printer – both used the same programming language. Both models had a mag-card reader – and a program written on one could be used on the other without modification. This was unique. In modern terms, the HP-67 and HP-97 were like handhelds and tablets sharing the same apps, like the iPhone and iPad, or Android phones and tablets. No matter how far we’ve come, we’ve been here before. Two important products were introduced this week. One was the new iPad from Apple. The other was SQL Server 2012 from Microsoft. 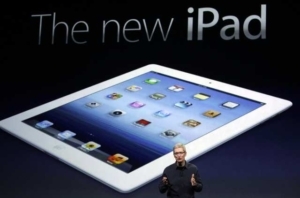 Apple unveils new iPad with HD display, better camera and 4G wireless. Starting price remains $499. That alert sums up Apple’s news, so let’s talk about SQL Server 2012. Large-scale enterprise databases – like SQL Server, DB2 or Oracle – are the least-talked about parts of IT infrastructure. They’re big, they’re fast, they’re essential to any data center or for any n-tiered application. Despite all the talk about clouds – and Database-as-a-Service – performance and bandwidth dictate that database servers must rename close to their application servers. For truly large projects, those are staying entirely or mainly on-premises for years to come. Yet SQL Server 2012 anticipates the move to the cloud, and makes it feasible to have applications that span both on-premises data centers and cloud-based servers. That’s important. SQL Server 2012 isn’t really news, of course. Customers have been using it for months – March 6 only saw the official “release to manufacturing” of the bits. Most of the details came out last October, when Microsoft started its previews, and focused on Big Data and integration with Hadoop. The list of other changes – beyond the Hadoop, Big Data and cloud features – shows an incremental upgrade. Better high-availability functions with multiple subject failover clusters and more flexible failover policies. Programmability enhancements with statistical semantic search, property-scoped full-text search and customizable proximity search, ad-hoc query paging, circular arc segment support for spatial types, and support for sequence objects. Some needed scalability and performance enhancements for data warehouses, and support for 15,000 partitions (up from 1,000 partitions). And improvements to permissions and role-based management, as well as better auditability. If you’re dying to make the move to mix cloud/on-premises computing (or want 4G LTE networking in your tablet), you should budget to make that purchase sooner rather than later. If you are happy with the your existing SQL Server 2008 R2 (or iPad 2), then keep your wallet in your pocket. Sure, you’ll probably go there eventually, but there’s no rational reason to be the first to make the upgrade. Give SQL Server 2012 (and the new iPad) time to settle down. I fought the hackers, and the hackers won. 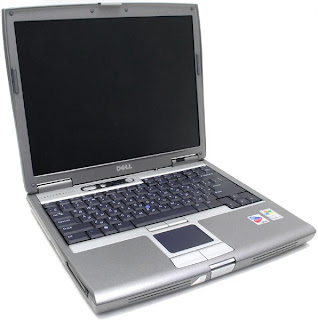 Here’s the story: One of our employees had a nice Dell Latitude D610 laptop, and it was totally messed up – running super-slow, lots of crashes, adware popups in the browser, and so-on. Because this was a huge productivity problem for a key employee, we solved it by buying her a new laptop this past summer. But what about the old laptop? It ended up on a shelf in my office. It’s a good machine: 1.7GHz Pentium M processor, 1400×1050 14-inch screen, 60GB hard drive, lots of RAM, DVD player, two batteries. Physically, it’s in great shape. It’s a shame not to put that laptop back into service. It so happened that I currently need a Windows laptop for a specific project. I pulled the Latitude off the shelf yesterday morning, scurried around to find its power supply brick (which was buried) and decided to clean it up. This shouldn’t take long, I thought. Big mistake, at least in terms of it being easy. After many hours of scrubbing, uninstalling software (the previous user had installed every free browser toolbar known to humanity) and running Microsoft Update a few dozen times, the machine was working. Sort of. It was still incredibly slow, and the browser still was being hijacked by adware. I ran an anti-virus check, and it discovered oodles of infestations. Dozens. Most of which the Sophos software could delete. However, there were four that it couldn’t destroy. Two of them were instances of the Virtum-Gen trojan. The other two were spyware, called ClickStream and Virtumondo. As the saying goes, I tried scrubbing, I tried soaking, nothing seemed to help. To make a long story short, after fighting with the malware last night for several hours, I’d had enough. It’s one thing to have a “project” laptop on my desk, and keep running Microsoft Update and rebooting while I do other work on my own machine. That’s not hard. It’s another to focus intensively on removing spyware and viruses. That takes a lot of time, patience and concentration, none of which this project could justify. So, this morning I blew away the Latitude’s hard drive and installed a clean copy of Windows XP Professional. I hadn’t wanted to do this, since there were applications on the Latitude that I wanted to keep. However, at some point you just have to admit defeat and cut your losses. The installation process for Win XP Pro itself was interminable. It’s been a while since I last did this, and I’d forgotten how long it takes. The installation disc I had was pre-Service Pack level, and it’s taken many hours to install Windows, add the service packs, and apply all the updates and security patches. But now, at least I have a cleanly configured Windows laptop that’s not infected, and runs fast, fast, fast. I’m glad I don’t fix PCs for a living.